Quarter-sawn Walnut flooring is also referred to as Vertical Grain. Standard pre-milled 1–7′ lengths of Quarter-sawn Walnut are usually all that is available. Most flooring is in 7-foot bundles with widths from 2¼″ to 5″. A long plank is very difficult to find because Walnut trees do not grow large enough to make quartered long-plank flooring. Moisture content is between 6% and 8% for quick acclimation. Quarter-sawn Walnut only found in unfinished solid but can be custom-prefinished in ¾″ solid or engineered with a veneer top layer. Quartered Walnut flooring is very rare. Custom orders usually demand 3–4 weeks for production, depending on lumber availability. Pre-milled standard 7-foot bundles are not a largely stocked item. Quarter-sawn American Walnut will have a uniform brown appearance. The vertical grain produces a muted but striped appearance. Some of the boards can have a curly or wavy effect. Sapwood, knots, and surface defects are removed in this grade. Walnut is unique compared to other woods. Walnut reacts unusually to sunlight with some water-based and aluminum oxide finishes (it tends to lighten, while most other woods darken). For that reason, oil-based finishes are recommended, in that they allow the Walnut to darken naturally with exposure to sunlight. A de-waxed shellac or lacquer can be first applied under the oil to protect the natural color of the wood. 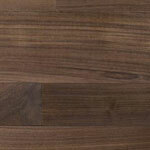 Quarter-sawn Walnut is a considered a hardwood but is very soft in comparison to Red Oak. This wood is relatively stable in comparison to other species like Yellow Pine. Although a hardwood, Quartered Walnut flooring works with little difficulty with both hand and power tools. When installing the flooring, it is best to use a manual nailer, but staples and pneumatic nailers work well. Installation is quicker with higher-grade flooring because the lengths of the boards are typically longer. The wood holds screws well, and it glues, stains, and polishes to a very attractive finish. It can be somewhat difficult to sand with flooring equipment because of its softness. The vertical grain tends to produce a 3D effect that can be seen and felt after sanding, which can be confusing to amateurs. Professional sanding and finishing is recommended. With a much higher price than Premium Plain-sawn, Quartered Walnut is used exclusively in high-end residential applications for a dramatically elegant floor. It is also used for color-contrasting borders.